The land that is collectively known as Bakersfield had been land that was a mix of Pardee land and privately held land. The had been recently fenced off (not that anyone ever apparently observed it) was the Barczewski property that extended from bottom of switch backs on the south end, over to Santa Monica ridge or the area with the trails (and jumps) north of Deer Lake. The property on the east side the fence it currently Pardee property. Pardee has already agreed to turn the land over to the city in the coming year. The sticking point had been the Barczewski property. Just confirmed today that the land will remain open space rather than being developed. That means a lot of things but it is mostly good news for riders. Caltrans has purchased the property with the intent of turning it over the the city to be included as open space. They purchased it as mitigation property for things like the widening of I-5 but the only portion of the land that has high mitigation value is the valley wetland directly west of the Deer Lake dam. They will be in there with heavy equipment to recontour the valley floor and ultimately reintroduce all native plants in a similar fashion as the property due west. All of the rest will remain untouched. 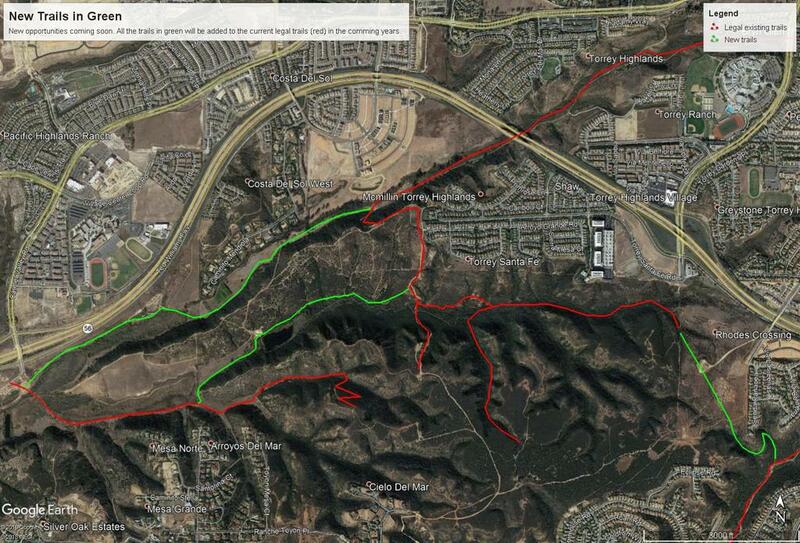 No road, no freeways, no development, just open space and trails. I do not know time frames yet but here is a basic outline once it all starts. - The property will be closed and connectivity will be severed during the earth moving stages. They will have large catapillar scapers moving a lot of dirt from Deer Valley over the the canyon at the bottom of the closed trail Sidewinder and Tunnel 5. As a result, you will see signage at the top of Switchbacks advising you do not go down. Just think SQUISH!!! - Minor reroute of the canyon trail (Don't fall off or in, I think) to move it about 10-15 feet away from the creek edge and create a long term, sustainable trail. - Adding two big legal loops to increase rider enjoyment, not that we don't like out and backs. One will be the western connector between Tunnel One, passing Deer Lake and connecting over to the switch backs. The second will be the completion of Mcgonigle Canyon all the way to the 56 and Camel Valley Rd junction. It has been blocked for nearly 2 decades by a chain link fence. - One more connector loop that will somewhat meet the need of the desired DMM East/West connector. With the completion of Rhodes crossing, we will be able to connect Tunnel One with Darkwood Canyon. The ride across the top of the mesa, through the development will be dirt sidewalks like at the top of cobbles but in and out of both canyons will be single track. You can see it on the right side of the map above. Again, I don't have time frames yet. Guestimate, based on the previous restoration, once the work starts, will be a couple weeks of heavy equipment grading and then 6-9 months of restoration work. As I get more info, I will post it here. *Just trying to make it feel like old times. Dammit, I first thought that said bear balls. No need. Seems to have popped up on MTBR instead. You should really do something about those rangers who hate mountain bikers! Hey, wait: we can blame SDMBA for sleigh bells on bikes? There's a lotta anger on EB's Norcal forum these days. I blame it on Trump. I haven't been there in ages - I've been too busy trying to build the Super Trail Friends United brand, where we jam bear balls down everybody's throats.